The premier class of the Motocross World Championship could be restricted to 350cc four-strokes in future instead of 450cc if proposals being considered by the FIM are ratified. 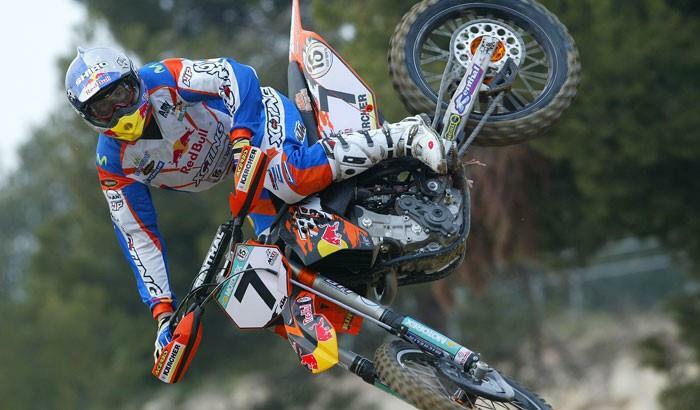 Leading off-road manufacturure KTM have come out in favour of the changes. Stefan Pierer CEO of KTM said he viewed the new regulations as an excellent way forward for the sport of Motocross and would help to guarantee its future in a responsible 21st century context. As well as a number of decisions already taken, KTM is also very positive about another regulation that is still under discussion but which will probably be finalised shortly. It concerns the reduction of the larger MX1 bikes down to 350 cc. Stefan Pierer is also AECM president and representative of the European Motorcycle Industry, and he said: "I welcome the farsighted and courageous decisions that have been made by FIM. I am convinced that by putting these steps into place, and above all by reducing the exhaust noise, that this is important and necessary for the future of Motocross sports. “I particularly welcome the new regulations for the two-stroke motorcycles because this creates attractive economic circumstances for young riders and for amateur sport, thus making it possible to further develop this market segment." Stefan Everts, KTM's factory team manager and 10-times MX World Champion is particularly positive about this prospect. He said: "This is definitely a very good move. With development of the latest technology, I am sure that riders will in fact be able to go quicker on a bike less than 450cc. These will be lighter and more fluid machines that are also better suited to the current track layouts. “This is valid beyond the Grand Prix racing scene and it will be excellent for amateur and hobby riders. The 450 cc bike is much too powerful for a amateur." Stefan Everts said he hoped the proposed regulation would come into effect as soon as possible to allow manufacturers to start working on an alternative displacement bike as soon as possible. Heinz Kinigadner, twice 250 cc Motocross World Champion and KTM Motorsport consultant emphasised that to move to give equal status and importance to both 2- and 4-stroke machines was an excellent way forward. He commented: "It is very good that the two stroke will now have a fairer chance in competition, in fact this is also made possible thanks to the enormous development in four-stroke technology in recent years. Two-stroke machines are an economical alternative for amateurs and beginners and this change in the regulations will provide a strong basis for the sport to further advance." Pit Beirer, KTM Offroad Sport Director spoke about the decision to allow young riders only to compete on two-stroke machines. Pit Beirer said: "To restrict all young competitors to riding two-stroke is a very important milestone in the sport. First I am convinced that a rider who learns to completely master a two-stroke machine can ride any motorcycle in the future. “Second, this is the only possibility for financing new riders into the sport. Thirdly, maintaining the bike and the fun factor for young guys is an enormous advantage." On the subject of the requirement to cut back on noise, KTM's international Motorsport Director Winni Kerschhaggl also said: "In the interest of the future of our sport for the noise level to go down dramatically. “Motocross as on outdoor sport can only go forward if we behave respectfully towards other people, especially in Europe, where our possibilities to ride are already limited. Of course cutting back on noise is more important for practice racks than it is for the World Championship. “But as GP racing functions as a role model for the entire sport, it is essential that factory teams go ahead and set a good example." Kerschhaggl also said that regarding the pending decision concerning the displacement for MX1 that he hoped that FIM would follow the proposal of MotoGP promoters Youthstream for the 350 cc option. "Since the MXoN it has been proven that 450's are no longer the fastest bikes and manufacturers have started thinking about alternative displacements. “It will be very helpful for us manufacturers if we get a clear direction from the FIM. It is even more important that promoters are provided with a class that is going to deliver exciting racing." 1) Mr Ippolito underlined the FIM program "significant noise reduction" in Motocross and SuperMoto, which has full support from Youthstream. A "dynamic noise test" should be introduced in MX1/2, MXoN and S1/2, SMoN as of 1.1.2009. The Technical Panel will make field tests as of the beginning of the 2008 season in order to work on the regulations for 2009. 2) Motocross Classes: as of 2010, single cylinder engines will be used in MX1 and MX2 and multi-cylinder in MX3, whether 2 or 4- stroke (open concept). The cubic capacity will be 250cc in MX2, and up to 650cc in MX3. Discussions are currently being held about the cubic capacity in MX1. A decision should be taken in the next three months. Concerning the MX2 class, a maximum age limit of 23 years will be introduced. Moreover, a World Champion will be allowed to defend his title only one time (in the following year). 3) The FIM Junior World Championship will have an additional class as of 1.1.2010: 65cc. All the classes (65cc, 85cc, 125cc) will be exclusively 2-stroke. 4) The motorcycle minimum weights will also be reviewed by the FIM Technical Panel. 5) The FIM President asked to study the problem of electronic sophisticated technology (such as traction control, etc) in Motocross and SuperMoto. Riders should be able to show their riding skills and talent without costly technical means.